I discovered a great little place here in Seoul where one can get t-shirts printed. Well, I didn’t actually discover it so much as was told about it by a friend. Anyway, it’s a great little place. You can choose from their selection of good quality shirts, sweatshirts and such-like, or take in your own and get whatever you like printed on them. I got several done and I’ll be going back to get some more. 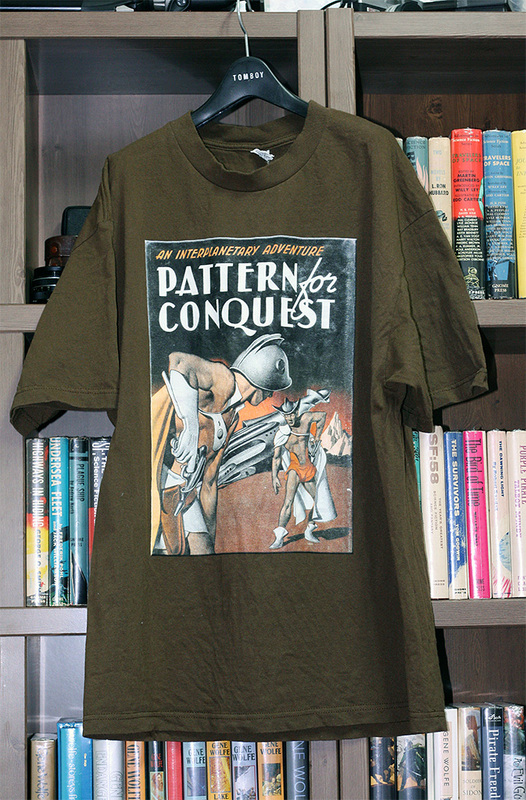 Why I’m talking about this, and I wanted to mention it here is that I scanned and adorned a shirt with the cover art of Pattern for Conquest. I must say, I am impressed with the results – both the shirts and the printing are of excellent quality. I’m definitely going to get some more done. This entry was posted on January 15, 2013 at 8:07 am and is filed under Uncategorized with tags George O. Smith, Pattern for Conquest. You can follow any responses to this entry through the RSS 2.0 feed. You can leave a response, or trackback from your own site.